Happy Horse Training ...go the WHOLE way! What is Happy Horse Training About? Mankind has shared his history with the horse for millennia, making use of his strength, speed and endurance, and borrowing his beauty and elegance. We owe it to the horse to give him back the care and lifestyle which respect his wild origins, as well as a way of riding and training that enhances his beauty instead of tarnishing it. 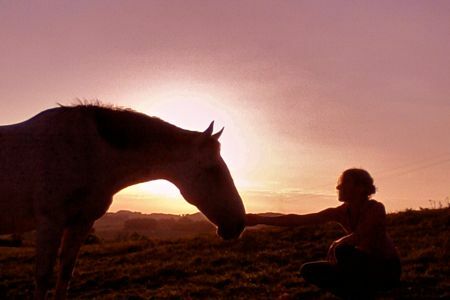 Happy Horse Training offers a truly holistic approach to our interaction with horses, encompassing all pieces of the puzzle to create a positive circle of well-being and performance. We are amongst the few in the horseworld to bridge the gap between natural horse care and training based on gymnastic principles. This website provides over 100 in-depth, well-written articles to help horse-owners combine natural care with good riding and training. We are quickly becoming one of the most extensive internet resources for intelligent holistic equitation. Outlined below are the main sections of the site, but have a look at the site plan to see a full list of our pages on many diverse subjects. Real dressage is simply being passionate about improving your horse's way of going, and discovering the wonderful unity that is possible between horse and rider. 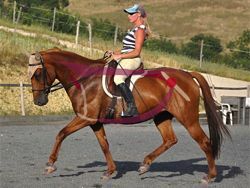 You don't have to be a dressage enthusiast for our information to be relevant to your riding. No matter what you do with your horse, getting the basics of your riding right will make a huge difference to your enjoyment of your horse… and to your horse's enjoyment of being ridden! In our dressage section you will discover insights about the rider's fundamental interaction with the horse that even top dressage trainers misunderstand. Horse training can be a daunting prospect. Whether starting with a youngster or simply making progress with an older horse, there are so many different techniques and training philosophies to consider. In fact there are universal principles to all good training that need to be established with any horse. What if you could feel confident in knowing what you are trying to achieve with your horse and how with a step-by-step process? To not only get your horse to use himself in the right way but at the same time to make him more relaxed and confident in you? solutions that get to the source of the problem instead of just treating the symptoms, then you will find a lot of help here. From good feeding to resolving physical problems to giving the horse a healthy lifestyle, it all comes together to make a happy horse that's ready for work. 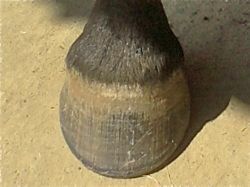 Natural hoof care: no hoof, no horse! More and more horse owners are coming to realize that shoeing is a harmful practice, in fact its damaging effects extend well beyond the hoof itself. Barefoot hoof care allows a horse's hooves to function in the way nature intended as part of his all-round health. Being passionate about the way horses move through dressage, we've come to realize what a fundamental role naturally healthy hooves have in supple movement. There is a fundamental energetic intelligence in all living beings which regulates the healthy functioning of the body. Problems that come up with horses both physically and behaviourally always have a source in an energetic malfunction. 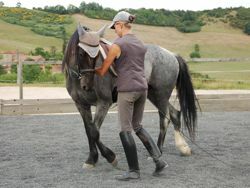 Equally riders are often held back by blocks that prevent their body from doing what it needs to in order to connect properly with the horse. Developing an awareness of this is a skill accessible to anyone - an extra sense that we all possess but rarely know how to use. Discover a unique course available to download that will open up this amazing realm, the basis of all holistic therapies. With so many specialist fields within equestrianism, and specialist fields within those, it can be easy to forget the whole picture. The amazing feeling of being as one with your horse depends not only on good riding, but on many factors that all contribute to making the horse happy and comfortable in himself. That's why on this site you'll find both sophisticated in-depth information on certain subjects, and a wide range of diverse topics that relate to the horse's well-being. It is all knowledge that we have come to through our own experience of seeking the highest quality of life and performance with our own horses. The Happy Horse Training Blog keeps you up to date with all the additions and changes to the happy-horse-training.com web site. Subscribe here. See whats going on in the Happy Horse Training facebook group! Holistic horse keeping is the way to ensure your horse’s health, happiness and performance because everything must go together for true success in any one of these areas. A collection of dressage articles that address the reality of riding and training a horse without force, constraint and superficial appearances. 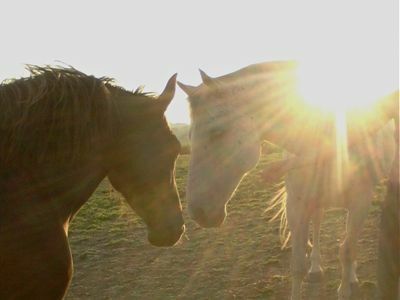 Horse Basics is the section of our website for anyone searching for simple, straightforward information about holistic horse care and training, which is the result of years of real experience. Observing domestic horses herd behavior is fascinating and can give us valuable insights into the way our horses view each other and life in general. Our horse healing philosophy combines providing the best individual care therapeutically and nutritionally, with as natural a lifestyle as possible and a careful, consistent gymnastic training. Horse Stories introduces you to the detailed biographies of many of the different horses we have worked with and learned from over the years. 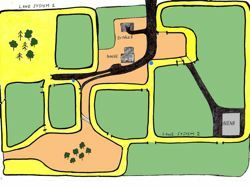 Dressage Warmbloods: The WHOLE Way! This is where we share the progress of our two beautiful dressage warmbloods, who we have raised from the age of six months in a totally holistic way. The Happy Horse Cartoon is a humorous look at the lives of horses, seen from their point of view. It is also firmly founded in the philosophy of Happy Horse Training.